The Registry of Companies (Registro de Empresas y Sociedades, RES) is an electronic record created by Law 20.659 dated February 8, 2013. It set up a simplified system which allows, easier and with no cost, to create, modify, transform, split, merge and dissolve Companies. 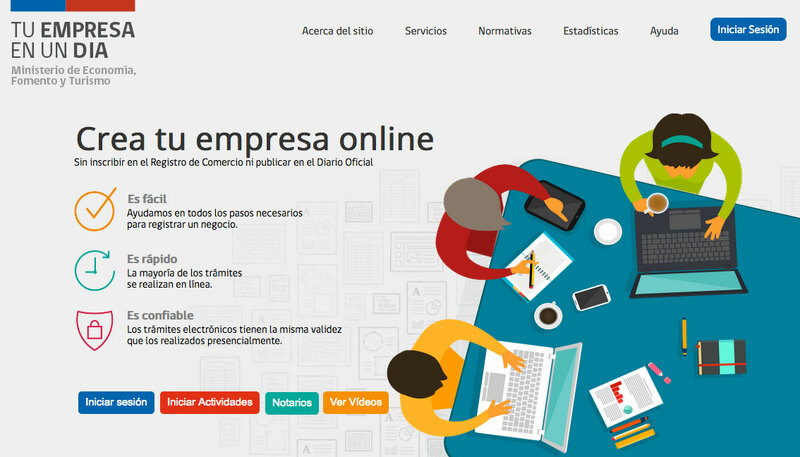 In short, the RES allows to create Companies through the portal www.tuempresaenundia.cl in a simple, quick and economic way, since you only need to register a user account. What type of Companies can I register in the Registry of Companies? Currently you can register 6 types of Companies: Limited Liability Companies, Individual Limited Liability Companies, Simple Joint-Stock Companies, Commercial Partnerships, Simple Limited Partnerships and Limited Joint-Stock Partnerships. Soon you will also be able to register Stock Corporations and Mutual Guarantee Corporations. What is the cost of registering a Company? For the electronic signature of the form and related activities, whatever the number of persons appearing before the same notary by a single act: 0,26 unidades de fomento. Review and incorporate to the Registry the mandatory documents for the signature of each person appearing, if applicable: 0,18 unidades de fomento. Incorporate to the Registry any other document, if applicable: 0,07 unidades de fomento. What are the requirements to register a Company? To previously register an account with the site. Any person with a Chilean ID (RUT) can register and enter data into the forms, however only partners or shareholders can sign these forms. The partners or shareholders must have an Advanced Electronic Signature in order to sign the forms. If they do not have it, they can obtain it with any of the Accredited Suppliers: Acepta, E-Sign, E-Cert, CERTINET, Paperless. If the partners or shareholders do not have the possibility to obtain an Advanced Electronic Signature, they will have to note the “Service Number” and present it before a Notary. The Notary must download and print a document prepared by the system, which must be signed by the partners or shareholders with handwritten signatures. After this, the Notary will sign the corresponding form with his Advanced Electronic Signature. Do I need a lawyer to register a Company? The traditional system of Companies’ incorporation required the intervention of a lawyer in the draft of the Public Deed of Incorporation. In the simplified system this is not required, since the forms available in the website www.tuempresaenundia.cl can be filled by any person registered with a user account. The portal also has the drafts and advice needed to complete the process without complications. However, it is recommended to seek advice from a lawyer for the incorporation of the Company. One of the partners or shareholders is abroad, can he or she register the Company? The foreign partner or shareholder must have a resident Chilean ID or an investor Chilean ID. To subscribe, he or she must have obtained an Advanced Electronic Signature in Chile, sign before a Chilean Notary or deliver a Power of Attorney in the Chilean consulate. Can the same person register more than one Company? Yes, the same person can register as many Companies as he or she wants. If I register a Company with this system, should I publish it in the Official Journal and register it in the Registry of Commerce? No, the Companies registered through the portal www.tuempresaenundia.cl do not require publication in the Official Journal or registration in the Register of Commerce as expressly stated in Article 19 final paragraph of the Law (Decree 45 of the Ministry of Economy, Development and Tourism, published in the Official Journal with date March 28, 2013) which states that “The registration of the forms replace, in regards of legal persons benefit by the Law, the solemnities of granting of Public Deed, registration and publication of extracts required by the laws regulating them”.